I, too, have always loved this month. 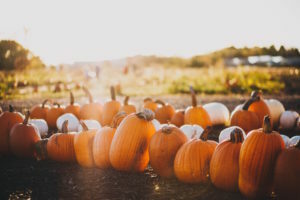 My childhood memories are filled with the requisite trip to the iconic Martin Viette Nursery on Long Island (now closed), where my brothers and I would get to pick out pumpkins, eat candied apples and go on a hayride around the property. When my own children were young, this month would include a trip to Arena Farms in Concord (also now closed!) to do the same activities that were such a memorable part of my own childhood. October meant apple picking at other local farms, spending a lot of the month creating Halloween decorations to tape around the front door, and assembling interesting costumes (two of my personal favorites: my daughter going trick or treating as Gloria Steinem and one of my sons parading around as an early, boxy Mac computer – inside a box!) Living in New England, October has also meant glorious sugar maple splendor, plentiful crisp apples and increasingly cool nights. So like Emily, like Mabel, like Millicent, like Helen, I, too, have long loved the month of October. And of course, this year I have another reason to celebrate the calendar’s shift to October: this will be the month that After Emily is released! To celebrate the month, I think I will do as she, herself, suggested, “and symbolically “…put a trinket on”!